Friends! I am so sorry for the radio silence. I have been in lovely London for the past six days working and exploring the city as my potential next home, and also the functionality of wordpress has failed me (the site is randomly breaking down), so the combination of those has resulted in far less blog posts than usual. To make up for it, I bring you one of the more fantastic and innovative cookie recipes I’ve made in recent memory. 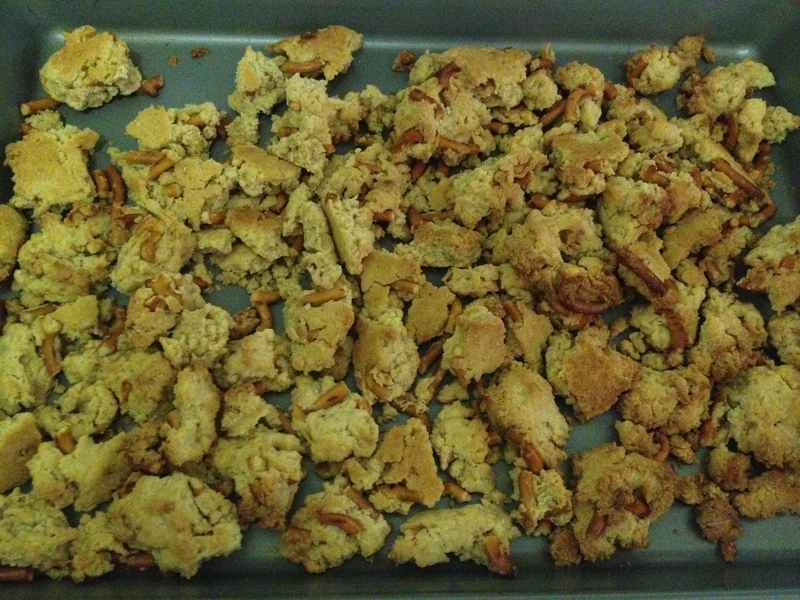 Like many above and beyond cookies, it requires an intermediary step of making something to put in the cookie – in this case, an amazing pretzel shortbread crumble. 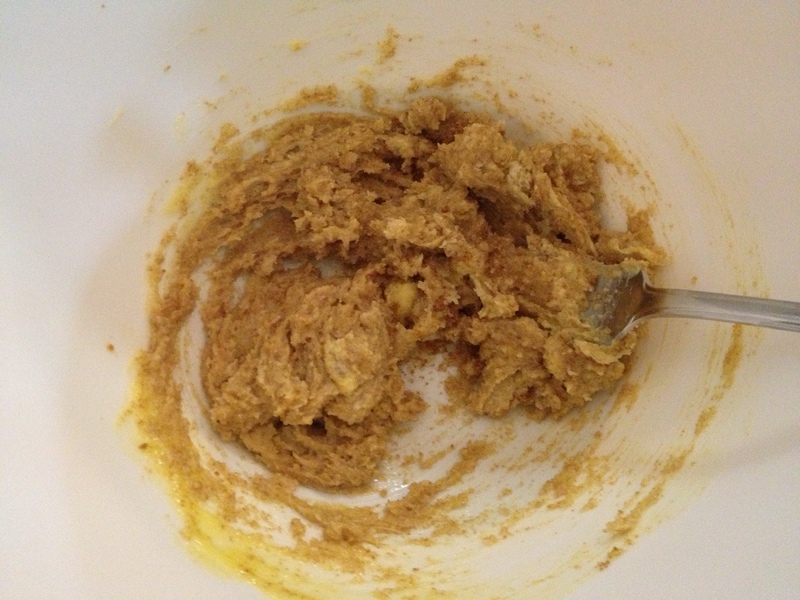 This can be done ahead of time which makes the actual cookie making process easier. 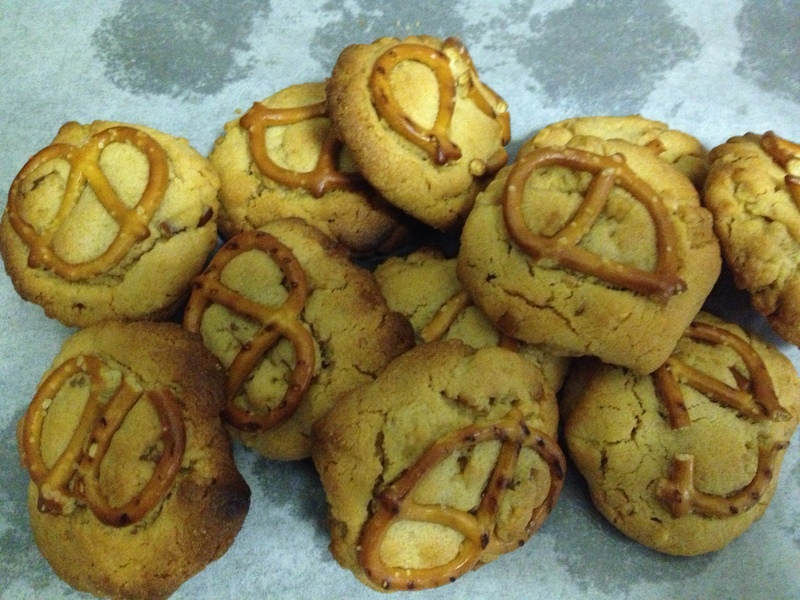 This is not actually a massively sweet cookie – definitely plays up the salty a bit more and I absolutely love the peanut butter and pretzel combination. (it’s akin to dipping pretzel sticks in peanut butter but tastes way better) The cookie is unashamedly indulgent and that is why I love it. They’re also quite attractive to look at which never hurts! Cream the butter and the sugars until pale and fluffy. Put in a pinch of sea salt and then the flour to make the dough. 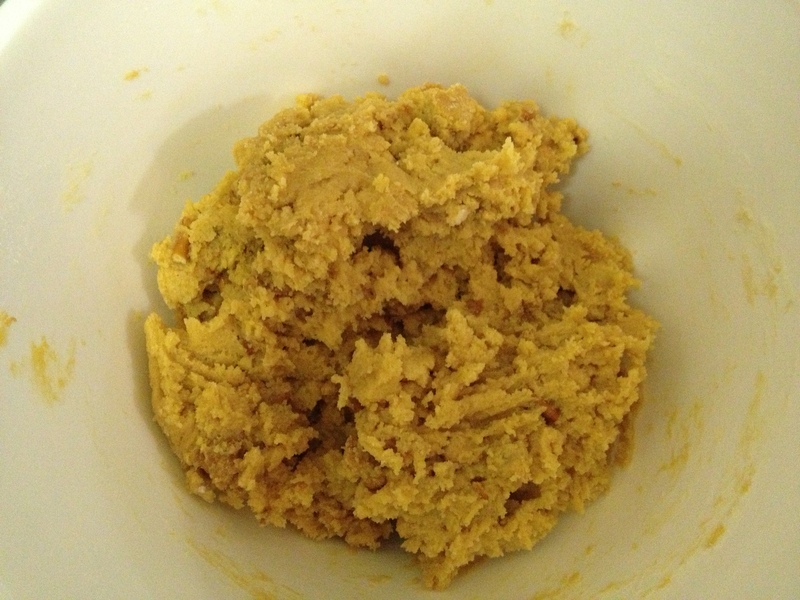 When the dough is not yet completely formed, pour in the pretzels, and then mold into a ball. (If it’s too sticky, add a bit more flour.) Cover the bowl with plastic wrap and refrigerate for at least half an hour. Preheat the oven to 190 C / 375 F, and once the dough has set, take it out of the fridge and break it up into little pieces on a baking tray. The great thing about this is that it can and should be quite messy – just a whole bunch of pieces. Bake it for about 20 minutes until it’s pale gold (if you want you can let it get slightly browner than that but keep an eye on it). Set aside and allow to cool completely – and you can keep this in an airtight container for up to a week. I made this in advance of making the actual cookies several days later. Cream the butter and sugar until fluffy. Add the peanut butter and combine thoroughly. 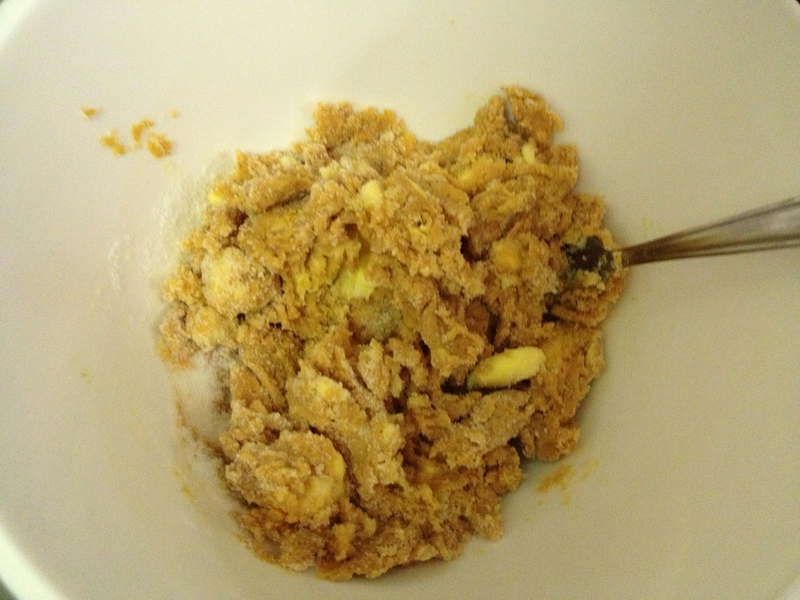 Then add the eggs and vanilla extract and beat until it’s a smooth mixture. Add the baking powder, sea salt, and then fold in the flour. 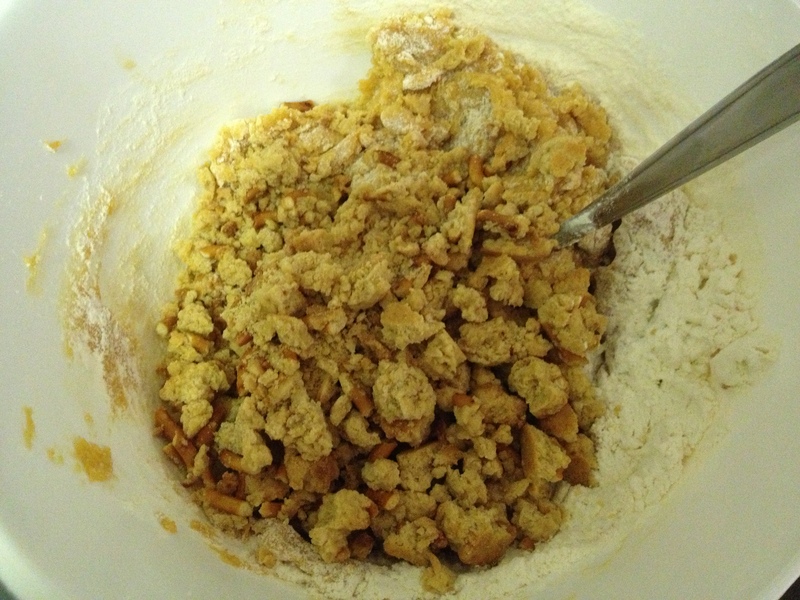 Then mix in the pretzel shortbread pieces to make a fairly sticky dough. Put the dough in the fridge for at least an hour (and you can do it overnight). When you’re ready to bake, preheat the oven to 180 C / 350 F. Roll out little balls of the dough and flatten on the sheet (leaving room in between them as they will spread). Take a whole mini pretzel and gently press it into the top of each cookie. Bake for about 15-20 minutes, turning the sheet half way through. They should be golden or light brown around the edges. Depending on oven temperatures it can take less time so watch them carefully starting at around 12 minutes. 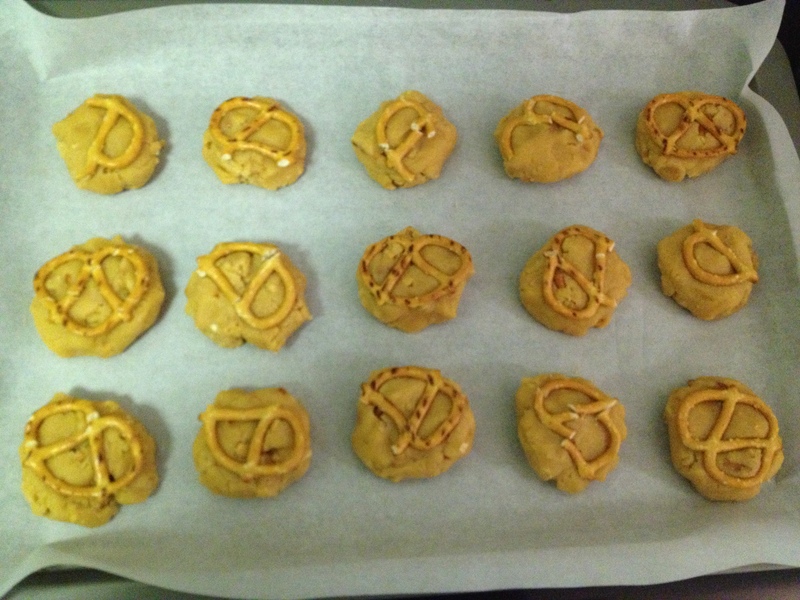 Cookies ready to go into the oven with the pretzels placed on them – adorable! And the delicious finished product. So worth the extra pretzel shortbread step. As you can tell from the marks on the sheet they are a bit greasy. This is not my healthiest cookie recipe, sorry. But believe me the taste is out of this world. Man, these cookies are good. The combination of peanut butter and pretzels is inspired, seriously. I love the crunch in the cookies that comes from the pretzel shortbread, the pretzel on the top just makes it look cute, and the cookie is soft and chewy aside from the crunchiness of the pretzel. This is a bit more work than a regular cookie and as such makes a fantastic birthday gift. I would challenge you to make these and then eat just one!